Last night I was pleased to find another update to the Instinct operating system. This one seems to address the browser. The update is a download through the phone update. It takes about one minute to download and takes roughly 5 minutes to install. You will be warned you cannot make a call until the update is complete. The browser seems to load faster and run better. The one caveat I've discovered is that it wipes out the bookmarks you have added. The default ones from Sprint remain unchanged. Check this out! The above picture is of the Imation Apollo Pro WX. 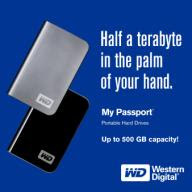 It is the first WUSB hard drive to hit the market. What does this mean? WUSB (Wireless USB) means that this device will provide incremental backups for a computer whenever it is in range of the device it is backing up. Bring home your laptop, fire it up, and as soon as the Apollo recognizes it, the backup process begins seamlessly and wirelessly. Pretty sweet. Drive sizes will range from 250GB to 1.5TB. No word on price or availability, but the rumor is you can get one in the fourth quarter this year... and that's just around the corner. Of course it's a the first of its kind so there may be some high prices and possibly some glitches, but for a "set it and forget it" backup. This is a great idea. I was in Long Island, NY on Friday doing a lecture. My schedule (and that of the airlines) was such that I couldn't leave Friday night, but had to leave early Saturday to return home. My flight from JFK left at 7:45 a.m. bound for Chicago with a very brief 35 minute layover and then on to KC and home. My first good experience was being reseated. I was near the back of the plane and mentioned to the gate agent I had a tight connection. She managed to move me forward from the 20's to row 15. Then shortly before takeoff, I was paged to get my belongings and contact a flight attendant. They had found a seat on the bulkhead in row 7 for me. Things were looking up. We had been in the air about 20 minutes when I noticed the flight attendants having people return their seats to the "upright and locked position". Strange. I then noticed the flight attendants waking a flight attendant who was a passenger on the flight and dozing. Stranger still. It was at this point an announcement came from the flight deck that we were experiencing engine problems and would be landing in Newark. Landing with engine problems is never a good thing. A few prayers and quite a bit of silence later, we were safely on the ground in Newark. Now the fun really began. Everyone on the plane needed to be rerouted since our plane was going nowhere. American brought in extra gate agents and began the heavy lifting of getting well over 100 passengers to their destination. I was fortunate enough to be number 3 in line. I was confirmed on a 1:00 flight to Chicago and then on to KC. I'd end up getting home about 5 hours later than originally planned. Ticket in hand, I headed to the Admiral's Club to wait it out. Upon checking in, the nice guy Preston at the desk asked why I wasn't on the 10:45 flight. I told him I had been told it was oversold and my chances were nill. He did some checking and told me he could put me on standby as #4 with a great chance of getting on. He also said he would monitor my status and if I made the flight he would book me on an earlier connection home from Chicago. Well, thanks to Preston, I made the earlier plane. I ended up back in KC only 2 hours behind schedule. Thanks to American Airlines and to Preston in particular. I now have a new favorite airline thanks to outstanding customer service. Keeping with my tradition of trying to keep things cool and more "off the wall" for my weekend posts, here is news of a first in many senses of the word. Youtube phenomenon Yves Rossy, a Swiss adrenaline junkie has been making headlines for a while now. He has developed and flown an true "flying wing" that he attaches to himself. This allows him to fly as a human jet. The device has jet engines, burns jet fuel, and allows him to actually fly like a plane or a bird. There have been a few Youtube videos of him and I've been fascinated by the whole concept. He jumps out of a plane with the wing attached, fires up the engines, flies, then parachutes to Earth. This weekend, Rossy flew his wing across the English Channel. The 22 mile trip is the longest he has ever accomplished and was his attempt to recreate the historic first ever air crossing of the Channel by French aviator Louis Bleriot 99 years ago. This video doesn't really do the technology justice, but it does show what he can do. The dinner meetings are designed as an adjunct to Novartis’ recently-launched web seminar series and are being offered for dentists who prefer live seminars and the opportunity to interact with the presenters as well as their peers. A total of ten 2-hour dinner meetings (www.oralhealthdinnermeeting.com) are to be hosted between September and December, and will be presented by a rotating roster of clinicians who are leading experts on this compelling and highly relevant subject. For more details and to register for any dinner meeting session of “Benefits of Bisphosphonate Therapy vs Frequency of Oral Complications: An Educational Program for Dental Professionals,” visit www.oralhealthdinnermeeting.com. Milpitas, CA, September 24, 2008 – Movea, Inc., the leader in motion-sensing technology for business communications, home entertainment and mobile computing, today announced the retail availability of its new Gyration Air Mouse with MotionSense technology. The compact, wireless mouse was created with the mobile professional in mind, and is designed to work in the air or on a flat surface like a desktop. Movea’s MotionSense technology provides precise in-air motion tracking, so users can control the mouse cursor intuitively and with ease, whether delivering a PowerPoint™ presentation or watching online videos. Precision motion sensors guarantee faithful responses to natural hand movements whether in the boardroom, the living room or a cramped space, such as a seat on an airplane or train. A simple flick of the wrist will command presentations, enhanced with Movea’s GyroTools™ presentation effects, or control multimedia entertainment on a laptop, allowing users to change the volume or skip a song on iTunes™, or flip a TV channel on Slingbox™. Weighing less than four ounces, the Air Mouse is compact enough to fit in a messenger bag, briefcase or purse, and versatile enough to be integrated with a PC or laptop from wherever a user wants to work or enjoy digital entertainment. With a sleek, ergonomic design, the Air Mouse works very comfortably for left- or right-handed consumers. Using a proprietary radio frequency (RF) technology, the in-air controls are effective up to 100 feet and work through walls. The Air Mouse includes a laser sensor for precise desktop tracking, making it ideal for working at a desk or other flat surface. The RF USB dongle stores conveniently inside the mouse, which ships with an elegant travel case and, due to its small size, easily packs into the smallest of handbags. The device will be available for purchase in early October with a suggested North America retail price of $99.99. 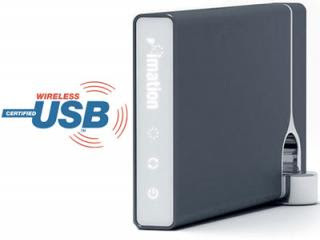 For more information on this and the family of Gyration motion-sensing products, visit www.gyration.com. Palm's newest smartphone, the Palm Treo Pro, was announced a while back but concerns arose since the device didn't have a wireless carrier. Today Palm has announced that they now have a carrier, but will not reveal who it is. Speculation is that is will be AT&T which also carries the iPhone. If the rumors are true, the device will not be avialable until December at the earliest. You can also already puchase the unlocked version that should work on any carrier, but there will be no carrier subsidy, meaning you'll have to pay the full price of $549 which is steep in comparison to iPhone, Blackberry, and my Samsung Instinct. Today Apple announced the Apple Ultracompact USB Power Adapter Exchange program. Replacement adapters will be available starting Friday, October 10, 2008. Order a replacement adapter via the web. These replacement adapters will ship within three weeks of your order, starting on Friday, October 10. If you apply via the web, you will also need to provide your name and address so that we can send you a new adapter along with a shipment box so that you can return the affected adapter to Apple. If you live in Latin America, we will announce the appropriate exchange program information before October 10. What is Maverick Secure Mobile (MSM)? Maverick Secure Mobile (MSM) is a security application. Secure mobile helps you protect your data, track your stolen device, retrieve your phonebook & disable the stolen device remotely.The application works in hidden mode and cannot be viewed in the device, To launch / customize this application one has to press pre defined short keys and password. After installing MSM in the device one must add “Reporting contact” in the application. Reporting contact can be your second number/friends number or any other mobile number on which you want to receive all the reports. In case of theft/loss, The moment SIM change is detected, Secure mobile will encrypt all the data on the device like the phonebook, images, messages etc. Now one can be assured about the privacy or misuse of the data on the device. The most important data on any device are the contacts. Using MSM one can retrieve phonebook from the stolen device, the entire phonebook will be retrieved by sending sms contact=all from the reporting device. As soon as the stolen device receives sms it will start sending the entire phonebook through SMS, and this by using the data plan of the thief. If the owner calls from reporting device to the stolen device, it will be termed as Spy Call. Spy call will switch on the loudspeaker & Mic of the stolen device remotely, so that the caller can actually listen to the conversation other person is engaged in. This call will not give any notification/ ring to the stolen device. The person who receives spy call will not be able to know he is being called by owner. Even if he comes to know about spy call, he cannot disconnect the spy call. To disable stolen device remotely, send sms = hang from the Reporting device to the stolen device, and it will raise an alarm and start playing a loud Siren. MSM will also display a customized message. Here, one can put his Name, Address, alternate number and award amount. Secure Mobile has a distinctive feature of incremental Data Back up. Using this feature one can back up all the data from the device to secure remote server using GPRS. So now all your data is very much secured and you can retrieve it without any hassle. a. In case the device is lost by sending SMS “Activate” from the reporting device. Last year, Google announced the Android initiative. An open source code to power the next generation of mobile phones. Since then we've heard occasional murmuring about the platform and devices, but nothing definite. Now comes word that on September 23 T-Mobile is having a launch party to showoff their first Android device. For the record, this is also the first Android device that the general public has ever seen. What can it all mean? It's all speculation at this point, but Google has a history of innovation that tends to stick around. An open source OS for mobile can only mean innovation. Let's see what September 23rd brings. I've posted in the past about the Eye-Fi, it's a wireless SD card that transfers photos wirelessly from your digital camera directly to your PC. It's slick and I understand from a friend who is using it that it works well. Now Lexar will be selling it as well. Calling the Lexar branded card "Shoot-n-Sync" it will be available in October for $99. This device is slick allowing you to upload images to your office database as you take them. This allows for "immediate" viewing by you and your patients. You need a wireless network to make it work, but that is a simple and inexpensive fix. Look for this in October at major retailers. Gummersbach, Germany (September 17, 2008) – JOBO AG announces today the availability of the new JOBO photoGPS – a small and lightweight Global Positioning System (GPS) receiver that fits directly on any digital camera’s hot shoe, just as if it were a regular flash unit, without the need for extra cables. Through an innovative new capture and process technology, this affordable new device allows automatic geo-tagging by capturing raw GPS data and time which enables new and more efficient ways to organize, search, visualize, and share photo collections. Each time a photographer’s digital camera takes a picture with the photoGPS attached to the camera’s hot shoe, JOBO’s photoGPS automatically captures raw GPS data too and stores this information in its own internal memory. When the photographer has finished taking photographs, they unload their photos onto their PC in their normal way and transfer the companion raw GPS data information onto the PC with the included JOBO photoGPS software. Matching times and locations is quick and easy, since the photos and raw GPS data were captured simultaneously. information corresponding to the times the raw GPS data was recorded. This is used by JOBO’s PC software to calculate the locations, reverse geocodes them, and geotags the photos with the resulting location information such as Country name, Region and District, City, Postal code, Street name, and nearby points of interest (POIs) such as tourist attractions, beaches, mountain peaks, museums, opera or theatre houses, concert halls, sport stadiums, parks, etc. In addition, Latitude, Longitude and Altitude are also available. And the JOBO photoGPS consumes very little power. One capture just needs 18 Megajoule (MJ). It is the camera’s flash synchronization connection that instantly awakens photoGPS. IRVINE, CA, Sep 15, 2008 (MARKET WIRE via COMTEX News Network) -- BIOLASE Technology, Inc. (NASDAQ: BLTI), the world's leading dental laser company, today filed a counterclaim lawsuit against Indianapolis, IN-based National Laser Technology (NLT), alleging violations of FDA regulations, federal trademark infringement, false designation of origin, unfair competition and false advertising in a suit involving a range of alleged business practices and market access for dental lasers. "BIOLASE is a respected company in the dentistry industry, and we will vigorously defend our reputation against what we believe is unfair business practices by competitors," said Chief Executive Officer Jake St. Philip. "This suit is about patient safety, fairness and truthful product promotion." The issue stems from a lawsuit in which NLT, as plaintiff, accused BIOLASE of coercing dentists into purchasing products from BIOLASE rather than from NLT. NLT also accused BIOLASE of monopolizing an alleged market for hard tissue dental lasers. BIOLASE has formally denied these allegations, and asserted its own counterclaims against NLT for unlawful conduct. BIOLASE's counterclaims allege that NLT has violated the Federal Food, Drug and Cosmetic Act by modifying and reselling BIOLASE's products without complying with federal medical device regulations. By providing modifications that have not been cleared by the FDA, BIOLASE alleges that these changes could potentially place dentists and BIOLASE at risk of liability if patients are injured by a laser adulterated by NLT. BIOLASE's counterclaims further allege that NLT intentionally infringed upon BIOLASE's federally registered trademarks by, among other things, unlawfully using the names "AMD Waterlase" and "AMDLase." BIOLASE seeks a permanent injunction enjoining NLT from continuing to engage in any unlawful conduct. BIOLASE also seeks damages and costs. The lawsuit is pending in the U.S. District Court for the Southern District of Indiana. "We believe that National Laser Technology has deliberately misled the public by suggesting an affiliation with BIOLASE that simply does not exist," St. Philip said. "Despite what NLT may be suggesting, there is no connection or association between NLT and BIOLASE. To be clear, NLT is not now and has never been an authorized dealer of BIOLASE products." Passport Elite(TM) and My Passport Essential(TM) portable drive models. previously only available in larger desktop drives." 160 GB, 250 GB, 320 GB, 400 GB and 500 GB. portable drives are available in 11 fashionable colors. -- Industry-leading 5-year limited warranty. I have it on good authority from a well placed Cadent iTero source that the 3D impression company will, in the not too distant future, allow doctors to export the program info to their lab if the lab has a CAD/CAM system for crown fabrication. The idea is that while the models are being made at Cadent, the lab can be fabricating the coping/substructure that will go on the model. Since all the information is digital, the coping should, in theory, fit the model like a glove upon its arrival. The lab can then begin stacking porcelain on the coping. The hope is to decrease turnaround time on lab cases by allowing both the lab and Cadent to be working on a case simultaneously. I'm back home after a weekend trip that took me to San Francisco and the California Dental Association's fall meeting. I spent most of my time in the area of the Gendex booth talking to doctors about the GX CB-500. Interest in 3D is definitely increasing. What was once thought to be a fairly unique imaging technology that was "too complex" for the dental office is rapidly reaching a point where it will be readily available if not commonplace. The questions and interactions I had with doctors showed many were comfortable with the concept of the technology and were now entering the "gathering more info" stage as they prepare to purchase. If you haven't begun to educate yourself about cone beam imaging, you owe it to yourself to do so. Even if you don't intend to own one you will want to send patients for scans and education will help you understand what that entails. The meeting overall looked to be a tad light in attendance. Although my friends who were there speaking reported good attendance at their courses. The status quo of a male-dominated profession is rapidly changing. According to Volume 1 of the 2006-07 Survey of Dental Education report series, women made up 43.2% of first-year students. “This shift may impact the bottom lines of manufacturers and distributors who are not able to adapt,” explains Dr. Doniger. For more information about “Winning over the Woman Dentist,” including available dates, contact Erin Foster at 732-389-4500, ext. 128 or efoster@lanmarkgroup.com. Sheri B. Doniger, DDS is a leading dental clinician, author, educator, and consultant who currently practices dentistry in Lincolnwood, IL. Dr. Doniger has authored numerous articles on topics ranging from periodontal disease to effective communications, and has presented many lectures with an ongoing focus on women in the dental industry. She is also an active member of numerous professional societies, including the American Association of Women Dentists, the American College of Dentists, Chicago Dental Society, American Dental Association, and the Illinois Dental Society. Furthermore, Dr. Doniger is the editor of the respected online publication, Woman Dentist e-Journal. Dr. Doniger provides Lanmark with ongoing insight, feedback, and validation on a variety of marketing and communications functions, including campaign strategies, product evaluations, training programs, clinical article reviews, public relations, key opinion leader recruitment, ad concept development, and continuing education program development and research. Rather than reinvent the wheel, here is a link to the a great review of the new iPods released this week. This is a great review done by C-net. Check it out! The storage business continues to amaze me. Toshiba has now announced a 240GB 1.8" hard drive. This tiny device is the kind of thing that shows up in MP3 players and other types of consumer electronics. The usual size of a hard drive in a typical laptop is 2.5" so, obviously, this thing is really small. Toshiba, the pioneer in small form factor hard disk drives (HDDs), continues to deliver innovative storage solutions with the addition of a new series of PATA 1.8-inch HDDs. The new single-platter (80GB/120GB) and dual-platter (240GB) 4200RPM HDD models deliver the highest capacity along with leading areal density for integration into portable media players, camcorders and ultra-mobile PCs. The 1.8-inch MKxx31GAL HDD series uses a new mechanical and firmware design for enhanced durability, making the drives well suited for slim-line mobile gadgets and PC applications. Design elements incorporated in the MK2431GAH optimize power efficiency to new levels with a 33-percent overall improvement in energy consumption efficiency** over Toshiba's previous generation two-platter, 160GB, 3600RPM 1.8-inch model. Here's an interesting take on a fairly common problem. When buying a new Windows PC the new owner is usually stunned to find *lots* of unwanted software already loaded in "preview editions" that then hound the user to upgrade (for a price) to the full featured version. These programs, frequently known as "bloatware" have been around for some time now and are a source of revenue for computer manufacturers. They get paid to put these unwanted programs on new systems. Now Best Buy is offering to remove them for an extra $30. Let me get this straight. I get junk forced on me that I didn't ask for and don't want to pay for and now someone will charge me $30 to what should've been done in the first place. Does anyone else see the lunacy in this? I've got a better idea. Don't put the garbage on there in the first place and we're all happier. Where has customer service gone? Is there better software for caries analysis on the horizon? The researchers at RMK engineering college have now developed an X-ray image analysis technique that reveals the pixel intensities at different X-ray wavelengths, much like the histogram analysis of images by a high-specification digital camera. Siva Kumar explains that the software reveals that the X-ray histogram and spectrum are very different depending on whether the teeth X-rayed are normal or exhibiting the early stages of decay. The researchers found that in the X-ray histogram the pixel intensities are concentrated in different ranges depending on degree of decay. The grainy and blurry photo above may very well be a nice fake. However, it does look a lot like the sleeves I've seen that are supposed to hold the new iPods so this very well may be the real thing. Of course we won't know until Tuesday when Steve Jobs will make the big announcement of exactly what changes will be made to the iPod line. Until then, this is all speculation... but it's fun isn't it? The ADA Council on Scientific Affairs has updated its recommendations for managing patients on oral bisphosphonate therapy. The council originally released the recommendations in July 2006. In this new re-evaluation of the evidence, the CSA determined that the incidence of bisphosphonate-associated osteonecrosis of the jaw (BON) remains very low and also concluded that no reliable screening or diagnostic tests are currently available to predict a patient's risk to develop this condition. On the diagnostic testing the council stated: "Therefore, while the expert panel recognized the value of predicting and mitigating the risk for developing BON in individual patients, until objective research studies document and correlate specificity, predictive value and reliability of such tests, no recommendations for their use can be made." Dr. Peter Jacobsen, CSA vice chair, added, "As professionals and clinicians we need to realize that expert opinion is only as good as the information available at the time. Our understanding of the effects of bisphosphonates on jaw bone is evolving and, as the new information about mechanism, risk factors, predictive criteria and treatment evolve, expert opinion on the best management practices will also evolve. Adjusting patient management, based on new information and techniques, will always be an ongoing responsibility for all dental professionals." Although the risk of developing BON while taking oral bisphosphonates is very small, dentists are advised to consult the updated recommendations and to be prepared to discuss the potential risks and benefits of dental care for their patients who are taking oral bisphosphonates. Given the risks associated with osteoporosis and the proven benefits of oral bisphosphonate therapy, the physician and patient should fully discuss any decision to alter the use of these medications. The recommendations are intended to assist dentists in maintaining good communication with not only their patients but the patient's physicians as well. To see the recommendations online on ADA.org, visit www.ada.org/prof/resources/topics/osteonecrosis.asp or call the ADA toll-free, Ext. 2878. Yesterday was the day for our hands-on training with the CB-500. While I've been through training on lots of high tech devices in the past, I've got to tell you this was one of the best experiences I've been through. First of all, when purchasing expensive technology in the past, it's generally been assumed that the buyer will take the staff and travel somewhere to learn. In this case, however, the trainer was flown to my location and spent the day giving the staff, my partner, and I intensive instructions on our device. Personally there is nothing like learning in your own environment with your own equipment. This increases the comfort level and helps ensure a smooth transition into using the technology. Our trainer, Nick, was very knowledgeable about the entire system and provided tons of good and useable information. When the day was over I felt that we were all ready to roll with the device on Monday morning. As a side note, I hope Nick got back home on time... he was flying through Charlotte and Hanna was knocking at the door. The images we took on each other and a couple of volunteers are nothing short of amazing. 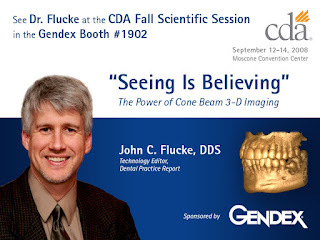 The future of dentistry is 3D and Gendex is offering a guided tour of that future. The company has hit a home run here with a great device, great support, and great training. If you are considering this technology, call your local Gendex dealer! SAN DIEGO (September 4, 2008) – TypoBuddy, was honored as the MASHUP OF THE DAY at Mashupawards.com for September 3, 2008. TypoBuddy’s mashup is featured at http://mashupawards.com/typo-buddy. The award is given to Web sites that have creative content and programming that produces sites that are both useful and cool for programmers who understand the backend of building a Web site. TypoBuddy was created to be added to the bargain-hunter’s arsenal. Typo Buddy searches Web Sites such as eBay and craigslist to find frequently misspelled words such as Abercrombie, Louis Vuitton and even the Wii which make these misspelled products hard or near impossible to find. This creates a window of opportunity for the savvy shopper. By using Typo Buddy, users can quickly and easily find misspelled listings for popular items, and since these hidden listings often go unnoticed buyers can save big! Mashup Awards is a hand-picked showcase of the best web mashups with awards served on a daily and monthly basis. Visit the www.typobuddy.com to discover hidden deals before the secret is out! With an invitation stating "Let's Rock", Apple has announced their next event in San Francisco on September 9th. Speculation abounds (and with good reason) that the iPod line will see a major revamp of both hardware and pricing. 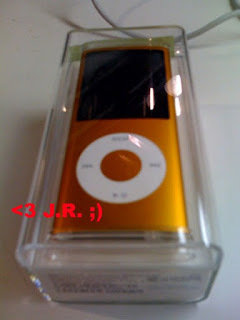 There is some history behind September announcements of new iPods, not the least of which is the coming holiday season. SAN FRANCISCO -(Dow Jones)- Amazon.com Inc. (AMZN) said Thursday that it will not launch a new version of its Kindle e-book reader this year. Rumors about a next-generation Kindle device were stoked last week after McAdams Wright Ragen analyst Tim Bueneman wrote in a note that Amazon is developing a new version of the Kindle and sees a big opportunity to market its e-book reader to college students. "Don't believe everything you read -- there's a lot of rumor and speculation out there about Kindle," said Amazon spokesman Craig Berman. "One thing I can tell you for sure is that there will be no new version of Kindle this year. A new version will come out sometime next year at the earliest." Berman declined to provide details about the new Kindle and would not comment on whether Amazon was indeed targeting the $5.5 billion U.S. textbook market. Since it's Labor Day here in the U.S. and most of us are off work I thought I'd blog about something incredibly cool that you'd really have to want to spend the money on. Check out the Draganflyer X6. It's a 6 rotor RC helicopter that develops enough lift to carry many different payloads, most of which are for video inspection and surveillance. Now before you get like me and start thinking of all the applications you can create to convince your wife it is a "must have", let me tell you that it's probably beyond the reasonably affordable range. The price is not available from the website and they do mention that grants are available from the Department of Homeland Security. Still, this is one really cool RC helicopter. Lock the Draganflyer X6 helicopter in place with a flick of a switch. The GPS hold function frees you to do other things while your helicopter maintains its position in the air. With true hands free operation, aerial photography becomes as easy as point and click. Use the ascend/descend toggle switch to move up and down within in a vertical column, pan and tilt the camera with the yaw and tilt controls, and press the shutter button on the handheld controller to snap your picture. The Draganflyer X6 helicopter utilizes an innovative six-rotor co-axial design. The six rotors are arranged as three counter-rotating co-axial pairs mounted at the ends of the three arms, with matched sets of counter-rotating rotor blades. Differential thrust from these three equally spaced points make the Draganflyer X6 helicopter able to maneuver quickly and precisely. The co-axial layout doubles the thrust without increasing the size of the footprint, and naturally eliminates loss of efficiency due to torque compensation. With wireless real-time video streaming from the Draganflyer X6 helicopter, filming and photographing has never been easier. Connect to the received video using video goggles or a recording device, both of which can plug into the output jacks on the bottom of the handheld controller. The video goggles allow you to view live video while still keeping an eye on the Draganflyer X6 helicopter. The same video can be simultaneously received and displayed using the video base station.